Virtual reality is up there with flying cars for gadgets that I thought would have showed up in the real world by now. And yet everytime I've seen a VR product, I end up disappointed. Though it makes some interesting strides, the Trimersion system is little different. It's a three part system consisting of a gun controller, goggles, and a wireless transmitter. 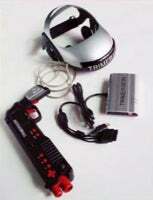 Attach the transmitter via USB to your computer (or to your Xbox or PS2), don the goggles for a 640x480 display, and pick up the gun controller and you're ready to run your way through most FPSs. In theory, anyway. I tried the system out, albeit briefly, and found it not as intuitive as I'd hoped. You control running with a joystick on the gun, while moving your head controls the direction in which you run. This ends up being fairly confusing, as I'm used to navigating virtual worlds with a mouse—while I can quickly spin 360° with that kind of control, my neck is sadly only limited to roughly a 90°turn in either direction. I kept ending up with my neck twisted at an odd angle. In addition, there was a lot of interference with the wireless signal, though the rep assured me that they had never had any problems in a "normal" environment—to be fair, the exhibition hall was pretty chock full of wireless signals. Having the controller shaped as a gun is a nifty idea, but in practice, you can't see any of the buttons while you're wearing the goggles, and the fact that you aim with your eyes as opposed to a gun will mess with anyone used to playing the sorts of games gun controllers are usually shipped with. On the upside, the Trimersion is compatible with both Mac and PC, and works with most of the FPS games out there, but its pricetag is a hefty $395. I'll stick with my mouse and keyboard for the moment, thanks.